Discussion in 'Architects & Engineers' started by conarb, Apr 16, 2015. I love a good conspiracy theory as much as the next guy, but seriously? 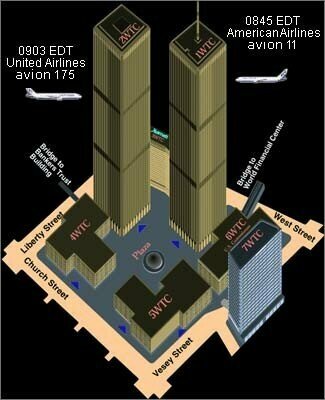 If 7 WTC was rigged with explosives, when do you suggest "they" went in and did all the prep? For planned demolition, companies spend weeks inside rigging, wiring, and doing light demo to make sure it all goes as planned. You think someone might have noticed this was going on? Or, are you suggesting elite demolition teams swooped into play immediately after the evacuation to load up? How many pounds of explosive do you suppose they carried in to level the building? MJ....What Conarb is getting at is: (I believe) in a noncombustible, protected structure, there should almost never be a catastrophic/collapse failure, which is why they get some of the leeway in the codes. WTC 7 was not hit by a plane, it may have been hit by debris, but it did collapse, and if a semi normal fire condition caused it, we need to look closer at our codes to see if something needs to change and if we give noncombustible building too much credit. If they want to look closer to see how the materials failed to gain a more comprehensive data set, I'm onboard. To think there were elite teams performing demolition operations while nobody noticed? To think there were elite teams performing demolition operations while nobody noticed? Brent. After the Snowden release, and the intercepted Victoria Nuland telephone call it appears to me that our buildings are more at risk from civil insurrection and attack from others in nations that our empire is trying to conquer, we are the most hatred empire the world has ever seen as we try to impose our religion (civil rights within, human rights outside) on the entire world, other nations and religions will and are fighting to the death to stop us. With the huge amounts of money we are spending to make our buildings earthquake/hurricane resistant it seems to me that it's more important to build our buildings resistant to attack from within and without. This is not only me but my customers who are more concerned about burglarproof structures, security gates, and other security concerns than they are the earthquake, green, and energy concerns of the codes being mandated. As an example, a computer tech engineer surprised me by refusing any smart-house features, he called a friend in Seattle and made a bet with him as to how long it would take him to hack his thermostat, with no information other than the address within 20 minutes he could move the temperature to anything we requested, we stood at the wall and watched him move the temperature to any setting we asked for over the phone, this guy did not want any locks that could be hacked in his home, he has no router, smart meters are now being hacked routinely, the marijuana growers are the biggest customers of the hackers since they consume tremendous amounts of water and electricity and for a few hundred a month a hacker can control the recorded consumption to show reasonable usage for the location. The AIA is right to look into and analyze this so we can build to withstand greater threats than we are now building for, just like the military is now outfitting local police with armored vehicles and other military gear; after all, we now have an international code that we expect the rest of the world to adopt, even if there are no more attacks on our homeland there are certainly going to be attacks in other nations. BTW, I do read The Russian Times, China Daily, and Aljazeera on a daily basis. It's envy not hatred. The rest of the world wants to be us. Even the middle east. That will taper off once we are Mexico. We could clad all tall buildings in heat treated 1/4" steel cladding. That way all new energy codes cAn be met, and we can minimize bird strikes. Who's on the code board that we know? No, it used to be envy and is still in places like Mexico, but in much of the world it's hatred, at the Sochi Olympics Russia agreed to the disability activists' demands and held a Special Olympics, then at the last minute Obama demanded that they accept Gays, China has jailed some feminists and Hillary has demanded that they release them, Obama just demanded that South Americans adopt our Human Rights demands, no matter what anyone thinks of these issues we have no right to demand what others do on their soil. We are stil occupying Germany and Japan 70 years after the end of WWII, I have a cousin who lives in Germany but has to drive in the United States, he says our rules are absurd, he drove the Autobahn from his home to Budapest averaging 200kph (120 MPH), the slow cars voluntarily keep to the left of the faster cars, here the slow cars think they have every right to the road as the better cars, it's our egalitarianism that we are trying to force onto the rest of the world. I have a friend who came here from Chile, he was a partner in an airplane with me, he made a small fortune here but has left and lives in Russia now, he said that they are coming out of Socialism and could be a free country while we are plunging into Socialism losing all of our freedoms, there is no more opportunity here anymore like when he came. What is our military doing all over the world? Trying to enforce our agenda on the world, if the Muslims want to cut off their people's heads that's their business, not ours. Why did the people flying the planes want to hurt us on 9/11, they hate us for trying to force our social justice religion on them, if they want to cover their women's heads with burkas that is none of our business. As long as we keep killing people all over the world to force social justice on them they are going to fight back. Things like drugs, alcohol, women's rights, and homosexuality are forbidden by some religions, we are trying to force evil on them as they see it. My point is that if we are going to keep trying to conquer countries and force our agenda on them be prepared for them to fight back any way they can, we are shooting the lower classes in the streets while we are telling the upper classes how much water and energy they can use, we have come closer to conquering the world than any empire in history, we have Russia and China surrounded by nuclear missiles, we have tanks running around the Russian Border in Lithuania right now, we are telling China that they can't build sand islands in the South China Sea to extend their domain, while Obama has just designated a huge swath of the Pacific Ocean as a National Monument, extending our domain ever closer to them and it's nothing but water, but they can't fish or drill for oil there now that we've claimed it. We have written Agenda 21 into the United Nations, this will be implemented by what George H.W. Bush called our New World Order, and I bet Bush isn't smart enough to have even read H.G. Wells new World Order. wherein he declares American exceptionalism setting us off on a course to conquer the world through our vassal the United Nations. Many years later, the explosion was traced to Michael Kristoff, a Slovak immigrant. Kristoff had served in the US Army in World War I, but admitted to working for German agents (transporting suitcases) in 1915 and 1916 while the US was still neutral. According to Kristoff, two of the guards at Black Tom were German agents. It is likely that the bombing involved some of the techniques developed by German agents working for German ambassador Count Johann Heinrich von Bernstorff and German Naval Intelligence officer Franz von Rintelen, using the cigar bombs developed by Doctor Walter Scheele. Suspicion at the time fell solely on German saboteurs such as Kurt Jahnke and his assistant Lothar Witzke, who are still judged as legally responsible.Later investigations in the aftermath of the Annie Larsen affair unearthed links between the Ghadar conspiracy and the Black Tom explosion.